If you are a caregiver, formal or informal, or if you are in a profession that requires you to care for or to support others -- either people, animals, or the environment, you may at some time experience compassion fatigue. Simply put, compassion fatigue means that your ability to feel compassion is compromised due to chronic stress. Hans Selye, a medical pioneer in the field, defined stress as the 'nonspecific response to any demand, including the efforts to cope with the wear and tear in the body caused by life at any one time’. (The Stress of Life, Hans Selye, M.D, 1956). Stress is the failure of the body to adapt to these demands. It may be helpful to complete the short ProQOL checklist to see if you may suffer from compassion fatigue. The good news is this condition is being studied and considered by increasing numbers of professionals in diverse fields -- psychology and neuroscience are examples. Compassion fatigue now has a working vocabulary, and it has many informed, creative people contributing ideas on ways to help you deal with or minimize your compassion fatigue. Please visit the Resources page for a listing of many helpful books, articles and websites for more information on addressing compassion fatigue and vicarious trauma. A way to address both anxiety and depression -- perk up or calm down, yoga can do both. For those with an established yoga practice, please visit our FREE page for some ideas on things to do in the office setting or at home. Here are some easy steps to help you incorporate this simple tool into your personal self-care stress management box of tools. Set yourself up for success from the start. If you have 5 minutes, start with 5 minutes. Learn some easy stretching and breathing techniques -- go to our FREE page and enjoy the breaks, both MP3s and some written ideas- all under 5 minutes. It will grow naturally from there as you meet with success and like how it feels. Share the five minute breaks with others -- either family, clients, coworkers, or friends. Post one of the stress breaks from the FREE page in the break room at work -- spread some seeds of stress management. If you are new to yoga, try 20-30 minutes of a yoga DVD or on-line at home to become familiar with it. 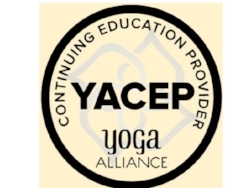 There are so many kinds of yoga, and styles of teaching, find one that resonates with you. Look until you have found one that meets your needs now. If you don’t like what you find, keep looking! Probably it’s the style, not yoga, that you don’t like. Find a yoga class, but make sure it meets your physical needs. Read the class description before you go -- some are for beginners and some geared for more advanced students. Go to class a few minutes early and chat with the teacher about the class and any concerns or questions you may have. Always remember, a teacher should make you feel safe. If that is not happening for you, please leave the class.